This is the changelog for the Deled trunk, i.e. the latest version of the source that will be the upcoming binary release. Only changes that have actually been committed will be listed here (so uncommitted patches will be pending until we get around to merge them in). I'll format things as we go (and add screenshots, etc), but if you have suggestions, or would like be credited in a different way (with your full name, for example), just post in this thread and we'll sort it out. Eventually this will be the changelog posted as news and kept around as archive. - The merge tool has been improved: it now merges more complex sets of polygons and automatically removes redundant vertices (Chronozphere). - An Edge Bevel tool has been added (Jeroen). 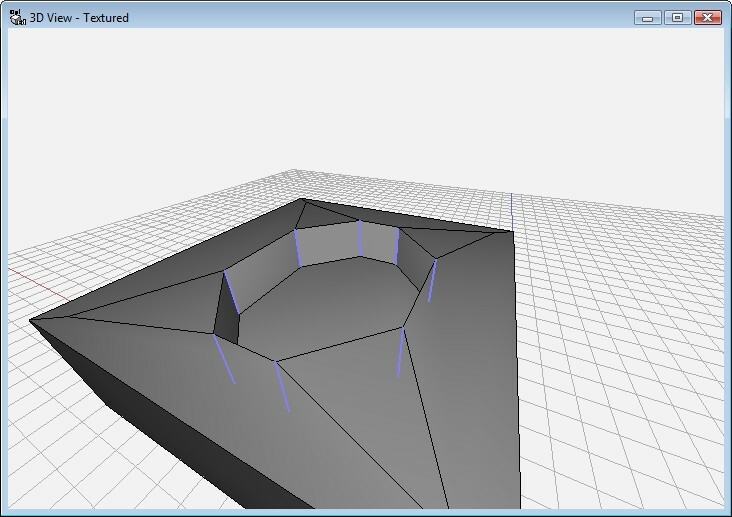 - Click-dragging near the edge of the 3D view no longer causes erroneous mouse navigation (Fik). - Material Editor selection when exiting the tool no longer changes material on selected primitives (Chronozphere). - Activating Material Replace no longer triggers an Access Violation (Fik, Chronozphere). - Using the arrow keys in face mode no longer triggers an Access Violation (Chronozphere). - All blend modes, except replace, now take the texture alpha values into account (Chronozphere). - When deleting polygons, the selection of highlighted polygons is also cleared. This solves a nasty access violation (Jeroen). - The confirmation question for deleting polygons has been removed. Speeds up the workflow a bit. Awesome fixes and new functions that work differently now.. Great job guys..
Sweet! That's a nice set of extra features/bugfixes, don't ya agree? Please, thoroughly test this and report any issues! The new functions that I used, work like a dream. Beveling and alpha mode texturing. BTW, the texture was placed on the object using the Projection pluggin, along the Y axis. I've included the orginal alpha png texture, so you can try out different modes of applying the texture. Excellent! Thanks for the report - it's good to see beta's being tested like this. Thanks for the info! Keep on DeleD'ing. But...but....but.....I just finally got the last version downloaded and my svn updated......Oh well...guess I'll just have to be a little quicker this time. Same thing could be changed into a lowpoly gladiator arena as well.